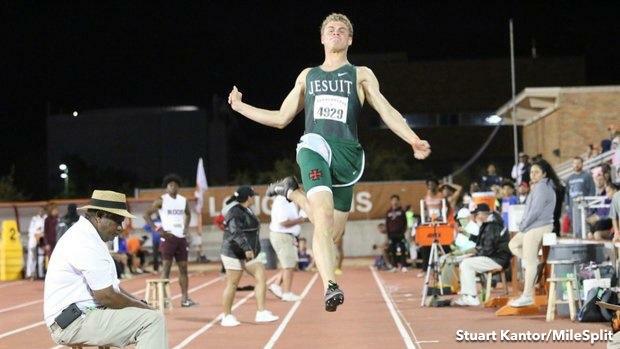 The takeoff in the long jump is more of a run into the air than it is an actual jump. The best long jumpers on any level are sprinting through the takeoff phase rather than gathering up and leaping. The top male long jumpers in the world hit speeds of around 24 miles per hour on the runway . The best females hit speeds of about 20 miles per hour . These athletes are tremendous sprinters on the runway, and their takeoff phase acts as a facilitator of that speed, such that they don't slow down much as they redirect from horizontal motion into a takeoff angle. Distance in the long jump is mainly achieved through the combination of speed and takeoff angle. Too steep of an angle will have the takeoff end up much like towering pop fly in baseball--the flight of the ball will have immense vertical velocity and altitude, but will barely clear the infield. By contrast, a line-drive with the same exit velocity off the bat will go over the outfield fence. Quality long jumps tend to fall into a takeoff angle range of roughly 20 to 30 degrees. The general rule is this: The faster the jumper, the lower the takeoff angle needed. And while vertical height is definitely achieved in the long jump, it is not a result of a steep angle. A flight's apex shouldn't occur immediately after the takeoff board. It must be farther out. Note: On his world record jump of 29 feet, 4.5 inches, Mike Powell had a maximum hip height of 6 feet, 8 inches at the peak of his flight--but his takeoff angle was only 24 degrees . So jumps that go far are marked by a gradual ascent in flight trajectory, followed by a gradual angle of descent during the second half of flight. To set up a takeoff, the last two steps of the approach are executed differently than all the previous steps in a few ways. On the last two steps--known as the penultimate and plant steps--foot contact to the ground should be flat-footed. This differs from all the previous approach steps where the athlete contacts the ground first with the ball of the foot, just like a 100 meter runner. While sprinting down the runway, the arm angles move through large ranges of motion. On the last two steps, however, they tend to shorten up. On the last step, as the takeoff foot is brought forward to plant down on to the board, the height of the knee is much less than on a normal sprint stride--in biomechanics this is called an acyclic movement. In order to prevent too high of an angle, great long jumpers drop very subtly on the second-to-last step. On the plant step, the center of mass passes over and past the planted foot before relinquishing contact with the board. This guarantees they are taking velocity through the takeoff and into the pit. The takeoff does not exist in a vacuum. It's set up by uniform acceleration down the runway. The torso should be upright going into the last two steps. The athlete must learn to sprint over flat-footed contacts during the last two steps. The goal is to sprint to the other side of the board. Avoiding stressing huge height in the jump. An appropriate takeoff angle is much lower than most athletes realize. The faster one gets via training, the more potential they have to jump far. Acceleration development on the track is key for long jumpers. They must be great sprinters for 30 to 40 meters. Teach flat-footed contacts on the last two steps and upright posture. While the penultimate stride is commonly longer than the plant stride, its length is a byproduct of proper execution more so than from a cognitive focus. If the athlete accelerates down the runway as they should, they are moving at their fastest going into the last two steps. The higher the velocity, the more ground is covered per step. The takeoff foot is planted slightly in front of the body. Planting directly under the body will cause over rotation in the air. Planting excessively far out will cause jarring/braking. The drive knee-free leg-- should come through with a dorsiflexed foot. However, knee drive at high speed is typically an instinctive or default movement. On the second-to-last step, a flat-footed contact usually triggers just enough flexion in the knee and hip joints to lower the center of mass, setting up an appropriate angle of takeoff. Deliberately teaching a dip is usually not necessary. It's more productive to stress sprinting over a flat-footed contact. 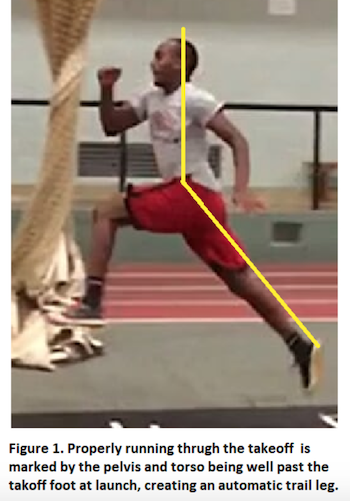 One telltale characteristic of a good takeoff is that just after the jumper leaves the board, the takeoff leg trails behind the body, similar to the hurdles-see photo in figure 1. By comparison, if the athlete slows down or gathers for height, the takeoff leg will resemble the high jump where it extends nearly straight down. In the latter case, there will be hardly any displacement between the upper body and takeoff foot.